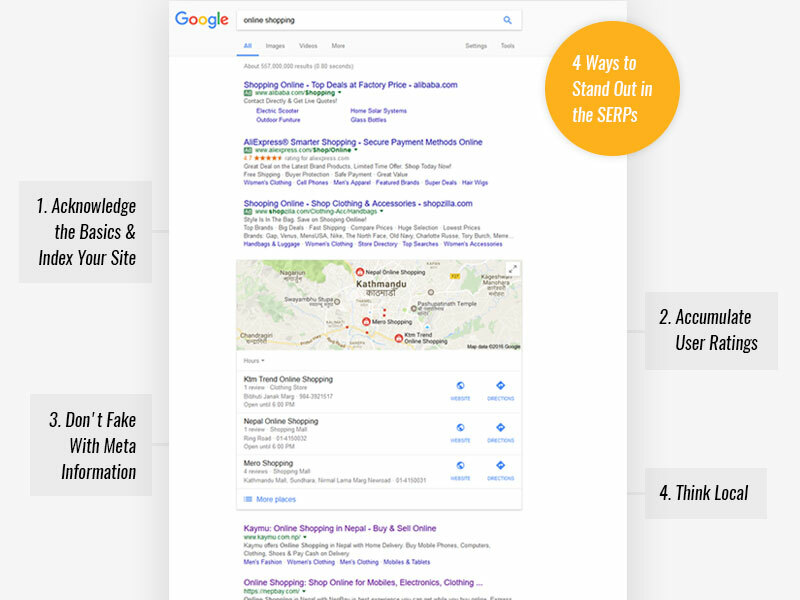 4 Tricks to Stay on the Top of SERPs | Pebble Infotech Pvt. Ltd. The ever changing algorithm of SEO is confusing, and by saying so I am not only pointing out newbies, it can even baffle the heads of most experienced SEO pros. With Google placing paid advertisement on top, it’s becoming hard for online firms to stay on the front page of SERPs. To keep your business alive and kicking, it’s more than essential to stand out in this competitive market. But how, in a market where everybody is up-to-date with current information, can you show your audiences about your awesome products and services. How can you score valuable clicks and keep yourself a step ahead of the game? Well, today, we will look into few tactics to help you tap into the steps of success. If we surf the internet, we can see thousands of sites perfectly designed and optimized to get maximum ROI. But, do all of these sites live up to the expectation? The answer is a big “NO”. The internet world is scary, and there are certain elements that need ardent attention. Before your website goes live, you have to ensure the basic groundwork. Otherwise, your site might end up with no clicks and no traffic. Set up Webmaster Tools and Google analytics, publish original contents, create a sitemap, ensure that your URLs are search engine friendly, avoid duplicate contents and make sure your social media channels are backing up your site. Besides that, check your robot.txt file. For those of you who have zero knowledge on robot.txt file, it is an extension protocol designed to help search engine robots to crawl into websites and index web pages. Despite having an appealing appearance and smooth navigation, your site will never stand a chance if you forget to run down the checklist mentioned above. The current algorithm of search engines is unique and challenging. Gone are the days when traditional SEO tactics used to do the trick. Today if you want your business to reach the sky, then you got to make stars your best friends. Yes, I am talking about user ratings. For this, you can use Google’s seller ratings. This extension allows you to import customer ratings and lets users know about your products and services. To use this feature you have to accumulate 150 reviews within 12 months. It will help you boost the CTR on your ads and you won’t have to spend a single dime extra. As mentioned by Google, “Customers with Seller Ratings are seeing 17% increment on their CTR rate than the same ads without.” It will help you to take your ranking to a whole new horizon and boost your revenue. Apart from that, these stars can also help you to increase organic traffic. All it takes is a little push from your side and the results can be very fruitful. Did you know? Duplicate meta-information is one of the main reasons for increasing bounce rates. Be straight with your Meta descriptions, and let your audiences know what you are really offering. The more legit the information, the more coveted clicks, it’s that simple. Meta information is not considered as a ranking factor but it does make a big impact. A well-written meta information can compel your audiences to click your link on SERPs, which allows you to bag those handy stars that we mentioned earlier. This also helps build a better sense of trust among your customers and inspires them to stick around for a while. Everyone wants to hit big, but it’s the smallest things that matter. Similarly, local search occupies a big space in ranking algorithm of different search engines. There are few things you can do to occupy the right spot. Focus on local SEO, ensure NAP consistency and make sure that your products receive reviews from local customers. It’s not a myth, standing on the top of SERPs is a mammoth task, but don’t be disappointed. Embrace the challenge and start from scratch. Concentrating on the basics will help you to broaden your reach and in time you’ll be able to compete with the big shots of your industry.